Instead of the "went there, done that" t-shirt or plastic namesake tchotchkes, take home a taste of Charleston with these pro-recommended and locally-made souvenirs. Olde Colony Bakery has been selling the traditional wafer since 1940. "This is a Charleston favorite. They are thin wafers made with toasted sesame seeds." Locally-made in Charleston, Jack Rudy's products will dress up your cocktail cart from tonic syrup to grenadine to elderflower tonic to Bourbon cocktail cherries. Christophe Paume is a third-generation French chocolatier selling his chocolate and pastry creations in Downtown Charleston. "Anything from Christophe. Anything. Anything." They have many different spirits made with seeds hand-picked from Myer’s Farm in Bowman, SC, including gin, vodka, whiskey, and rum. "They offer tours nearly every day and are run by some of the coolest locals in town." Charleston's First Distillery Since Prohibition and located downtown. In addition a sorghum whiskey, they make a rum, gin, and vodka. 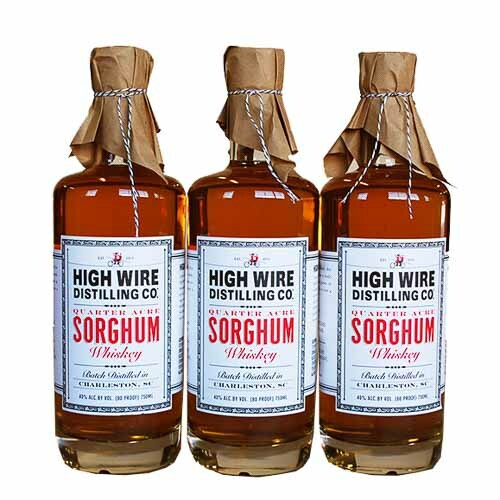 "I love the Sorghum Whiskey from High Wire." Take home beer from the oldest production micro-brewery in the state of South Carolina. They make a variety of pale and dark ales with year round flavors, as well as limited seasonal flavors. Recommended by bartender Megan Deschaine of 492. The gallery houses a group of artists that create ceramics. "There are a few artists in the studio. It's a great place for a conversation piece or to find a new favorite mug." The baskets are woven from local grass. This is a craft brought to the Lowcountry by slaves nearly 400 years ago. The baskets were used for collecting cotton and rice in the fields. "Handmade by descendants of West African slaves, these baskets are truly a work of art. They can take anywhere from half a day to three months to make." You can find Greg Johnsman's grits in many area restaurants and you can buy them either online or at the general store on his farm. "Greg Johnsman mills grits and rye flour using all 1930s milling equipment that he restored himself." "They're the best grits anywhere." Executive chef of 492 in Charleston. Bartender and bar manager at 492 in Charleston. Pastry chef at 492 in Charleston. Bartender and bar manager at Prohibition in Charleston. "The food scene here has just really exploded in the past three years." Sommelier Dan Thomas, of the Red Lion Inn and newly opened Eat on North, is your tour guide for picking up drinkable souvenirs in Berkshire County. Take home a taste of Charleston with these pro-recommended, locally-made souvenirs.